< - - Beautifully tumble polished, these gemstones of select Oregon agate come naturally in a variety of colors and patterns. As accent stones they are: suitable to create lapidary gifts of jewelry, decorate fountains, floral arrangements, gardens, aquariums, decorative bottles, candles, lamps or home decor. Collected over the last 40+ years this is part of a very old collection we purchased recently, the stone sizes are approx. 5/8", and will be approx. 100 stones per bag. Super polished, this is an excellent variety of assorted choice, tumbled select beach agates, from the central Oregon coast. Your sample bag will contain a mixture (as pictured) of beautifully patterned fancy agates including carnelian agate, cloud agates, highly sought after collectible blueblacks (a.k.a. Newport blues but they are actually beautiful black agates), and more that may include some colorful jaspers. Limited to stock on hand they are sold as 1½ pound bags, to create semi-precious arts & crafts projects & more! Assorted Polished Select Oregon Agate and Jasper - 1½ lb. Accent Stones - In Stock and ships immediately. Shipping weight 2 lbs. Just $11.25. Buy it NOW! Each stone is unique, please allow for natural variations. Warning! Choking Hazard! and petrified wood are available for sale in the showroom!! 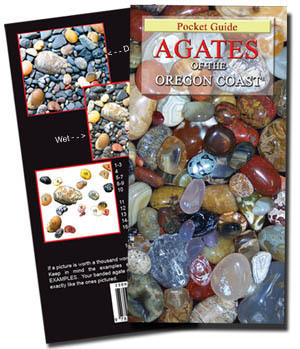 AGATES OF THE OREGON COAST An illustrated guide of information on agate, jasper, fossils and petrified wood commonly found on the Oregon Coast - by Myers - Now Available. Learn about the best known varieties and new to this printing are the oversites from the previous books, the stunning uncommon colors and varieties of agate to be found that would also include the enhydro (water agates), also a special section of agatized fossils, petrified wood, and fossils that may be found among the cobbles along the Pacific coastline. This color-illustrated guide gives tips on how to find beach agates from the border of California to Washington, read about the likely locales where these agates might be found . If a picture is worth a thousand words, this book says it ALL! The back cover alone has three illustrations showing the agates as they are found, of both wet and dry conditions, plus the third identifying what you see in the two color photos. Inside accurate color photos with descriptive text identifies the agate and jaspers plus petrified wood which means the difference between passing over a perfectly wonderful specimen of carnelian agate, colorful jasper or collectible blueblacks a.k.a. Oregon blues (they are actually beautiful black agates), rather than the basalt or "just another rock". With this book you can become the next best thing to an expert on Oregon agates. Softcover 15 pages, sized to fit in your pocket $4.95. Buy it NOW! 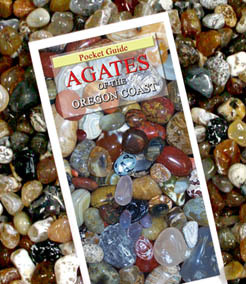 We are now the publishers of the book AGATES OF THE OREGON COAST - Pocket Guides, they are In Stock and ship immediately. Serious dealer inquiries invited from established book sellers, gift shops, and resorts! For further information, please contact us at (541) 264-5908, for our quanity discount schedule. Product availability & price subject to change without notice. © 1999 - 2015 Operated by FACETS Gem & Mineral Gallery LLC, All Rights Reserved.